Make a Reindeer in a Day! Includes tuition, materials, tea and coffee, and lunch. Get set for Christmas! Create your very own Rudolf – for your garden, home or as a gift – in an intensive one-day workshop with Sarah Webb. This course is an ideal introduction to willow sculpture, but expect to work hard to get your reindeer finished! As a guide, the reindeer you will make will measure approximately 30 inches high, 20 inches long and 14 inches wide. It is possible to reduce the size if, for example, you have confined space in which to transport your deer. 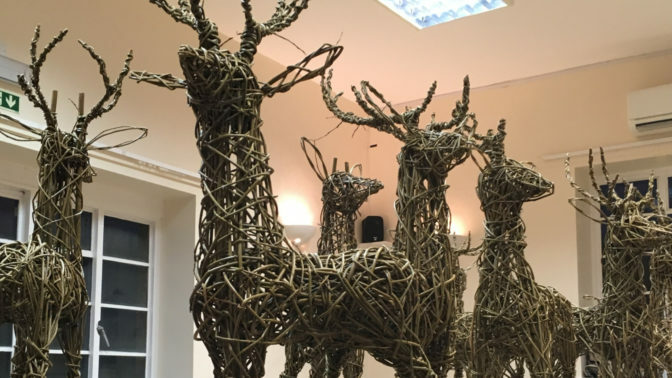 To make a larger deer (like those pictured) please check out our Christmas Bounty willow workshop with Sarah Webb, which allows sufficient time to make a bigger reindeer, alongside other Christmas delights! Suitable for beginners and intermediate makers. Sarah Webb – At the age of seventeen – and not really having any idea of what she wanted to do with her life – Sarah was lucky enough to be accepted onto a basketmaking apprenticeship working with one of the few remaining Somerset basket makers, Norman Studley. Her interview was very simple; he asked her to identify several baskets and then sat her down to make a square base. Having completed the task he agreed to take her on a trial basis, with one one month to prove herself. Over the next few years Sarah fell in love with willow and basketry; Norman was a very hard teacher to please but through him Sarah was set on a journey that still inspires her today. Sarah now lives and works in Somerset as a basket maker, willow artist and teacher. She makes and sells a variety of highest quality baskets and willow sculptures, as well as teaching the art of willow work, including traditional willow basketry, willow sculpture and lantern making.